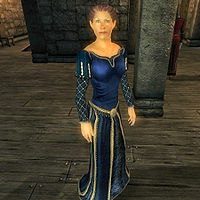 Delphine Jend, a Breton mage, is an Evoker of the Mages Guild and the creator of the celebrated Enemies Explode spell. She resides in the Bravil Guild Hall, where she sells spells and offers advanced Destruction training. Similarly to Bralsa Andaren, she dislikes Kynareth and her "woodland creatures". Delphine lives a very day-to-day existence, and the activities she pursues are mostly ruled by chance. She sleeps in her bed on the second floor of the guild building between midnight and 9am. After that, the way she passes the next eleven hours of her day is variable. In most cases (75%), she will be found in one of three locations around the ground floor contemplating her "PonderItem". When doing so, she will assume her "thinking" position, carefully touching her chin while looking up. She also has a much slimmer chance (15%) of aimlessly wandering around the ground floor. Finally, she has a 10% chance of training her magical skills by casting a Destruction spell in front of the stairs to the second floor. She will then eat dinner between 8pm and 10pm and spend the last two hours of her day sleepily wandering around the guild building. She wears upper-class attire consisting of a blue velvet outfit and gold trimmed shoes. She also carries her "PonderItem" and a sizable amount of gold. She doesn't wield any weapons, relying instead on a set of lower-level spells from all of the magical schools. These are also the same spells that you can buy cheaply off her, since her Mercantile is a mere 6. She will offer her services both as a spell vendor and a trainer when not eating, sleeping, and wandering between 9am and 8pm. When you approach her for the first time, she will introduce herself by saying: "Delphine Jend. Creator of the celebrated 'Enemies Explode' spell. Advanced Trainer in Destruction. And Mage Destined for Great Things." When asked about Bravil, she will tell you a bit more about herself instead: "I love my work. Fire, frost, shock, poison... little presents for Kynareth's cute little woodland creatures." On her work in the Guild she will say: "It's my job to help people learn the proper, constructive use of Destruction magic. And let's face it... blowing things up can be ever so much fun." If you haven't joined yet, she will point you towards Kud-Ei: "You'll need to talk to Kud-Ei if you want to join the guild. Or any of the heads of the local guild halls, for that matter." As an advanced trainer, she can provide you with the reference needed to initiate the Destruction Training quest and point you towards accomplished master trainer Bralsa Andaren: "If you want to know more, there's one person I can think of to teach you, though she's a bit... odd. You'll need to find Bralsa Andaren. Best mage I've ever seen, but a bit eccentric. Last I heard, she had camped out at a shrine to Kynareth, and was killing wildlife for fun, I think." "I understand Delphine Jend has some other mages worried. She's skilled, but a bit unpredictable." "I've heard she's quite skilled in Destruction, and is a favorite of Kud-Ei's." "That Delphine Jend seems dangerous to me. She's very skilled, but I think she's reckless." "I'm sure Kud-Ei will keep her in check. I know she has Jend teaching other mages now." "Have you heard about Delphine Jend, and her skills in spellcasting?" "Her skills with Destruction spells are supposedly impressive. I understand Kud-Ei has her teaching them at the Mages Guild." "Does Delphine Jend make you a bit nervous?" "I know Kud-Ei will keep her in check. She even has her teaching her spells to other Mages Guild members." Additionally, two of her fellow Guild members will direct you to Delphine for spells. Ita Rienus will say: "Delphine can get you a spell to summon bound armor, if you're interested. And if you're able, of course." Aryarie will tell you: "I'm just here doing research. If you need spells, talk to Ita or Delphine. They'll be happy to help." Delphine spends most of her days contemplating her "PonderItem". This is a bizarre object in her inventory that has no name, weight, value, picture, or apparent function. The only non-blank entries for it in the Construction Set are its editor ID ("PonderItem") and Form ID (00002340). If you kill her or pickpocket her, this item is visible in her inventory labeled <missing name>. When dropped, it looks like a giant flashing box with an exclamation point on it. If you have installed the Thieves Den official plug-in, it will instead be identified as "Ring" and will be a quest item (i.e., you cannot drop it any more). Dropping it in the Xbox 360 version will either cause the game to freeze or an error message to appear about the disc being unreadable (even if the game is has been downloaded). You will need to turn the Xbox off and restart it. Delphine's Enemies Explode spell is the most magicka intensive spell in the game outside of custom spells. The spell requires far more magicka to cast than Delphine has.